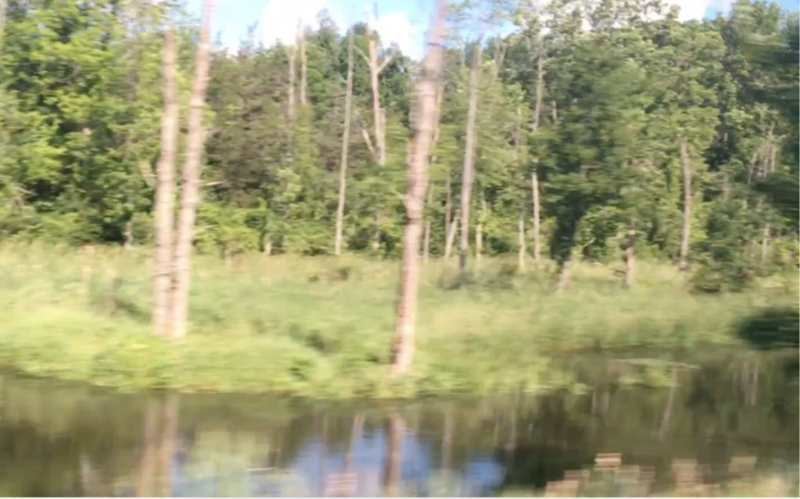 HRN went upriver last week to visit the bountiful northeast corner of New York’s Dutchess County. We joined a Farm Fresh Tour, orchestrated by EscapeMaker.com, in partnership with Metro-North Railroad and Dutchess Tourism, who put together the perfect daylong escape from Manhattan. 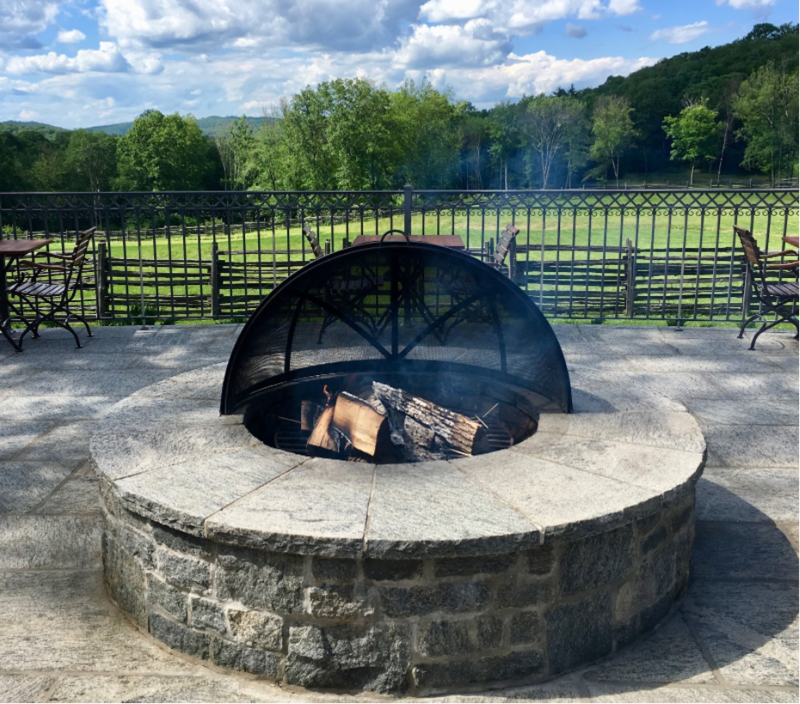 Dutchess County is a cultural hub just a few hours outside of New York City, with fertile farmland, beautiful greenery, and a rich history – it is our very own Provence. The day began with an early-morning departure from of Grand Central Station, bound for Wassaic. Coffee in hand, I boarded the 7:53am train along with my other tour group members and was handed a bag with snacks, water, and the day’s itinerary from our hosts Caylin Sanders and Kash Berkeley from EscapeMaker. Our itinerary promised a tasty day with artisan tea, locally roasted coffee, an organic farm tour, bourbon tasting, and a visit to a maple syrup estate –bon voyage! After one easy transfer at Southeast Station, we arrived in Wassaic at 10:24 and boarded our posh tour bus. We were greeted by representatives from Dutchess Tourism, MTA Metro-North and a pair of additional tour-guides, David Naczycz from Urban Oyster and EscapeMaker’s Jennifer Brizzi. 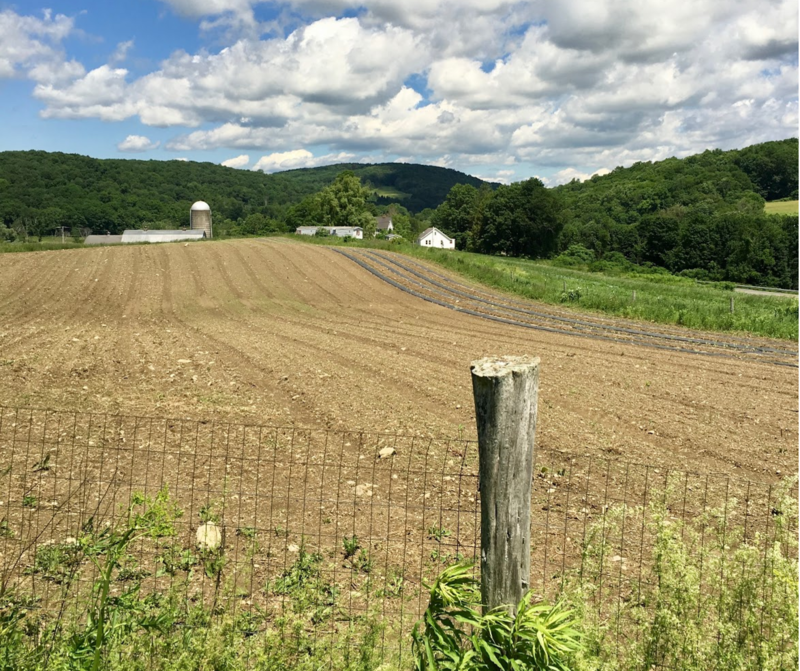 David shared some of the history of farming in Dutchess County, which saw a significant decrease during the industrial age due to competition with commercial farming and the northward spread of urbanization. The Hudson Valley, which Dutchess County is a part of, is seeing an agricultural and cultural renaissance. Small scale farms and artisan food and drink production is revitalizing the local economy and food culture. Here in New York City, we can reap the benefits of this movement by visiting our local Green Markets and supporting locally grown vendors from our area. Harney & Sons Teas storefront, in the Village of Millerton. Our first stop of the day was at Harney & Sons Teas in the Village of Millerton. 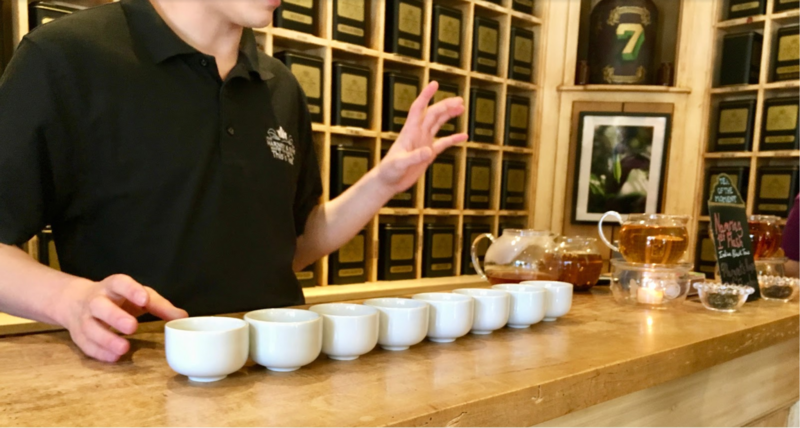 Family owned and operated for thirty-four years, Harney & Sons blends and packages their incredible teas at a facility just down the road from the cafe we visited. 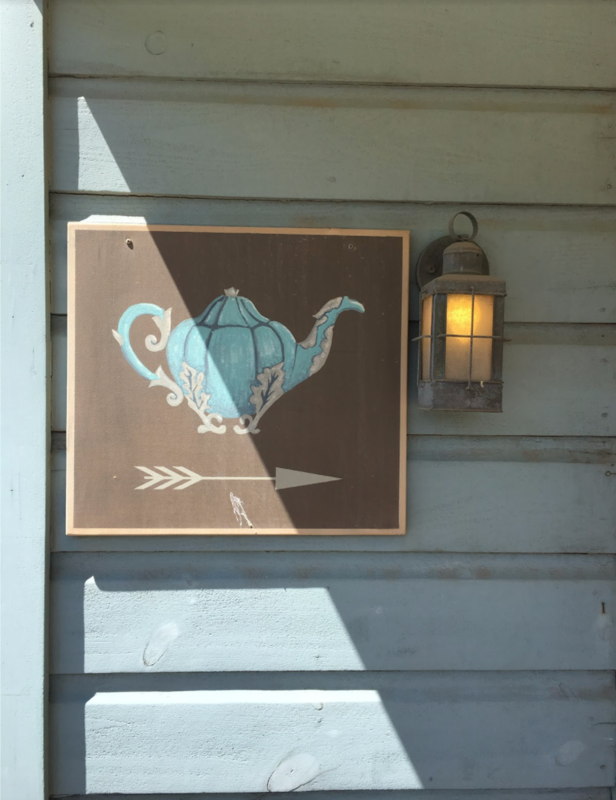 We sampled several delicious teas in their tasting room and learned from their on-staff expert, Levi, that the season in which a tea is harvested impacts the flavor. We tasted Darjeeling harvested in early spring or “first flush,” alongside the same tea harvested in late spring, “second flush,” the difference was distinct as the floral and earthy notes shifted slightly with each harvest. Harney & Sons Tea expert, Levi, explaining how to discern “first flush” vs. “second flush” Darjeeling. 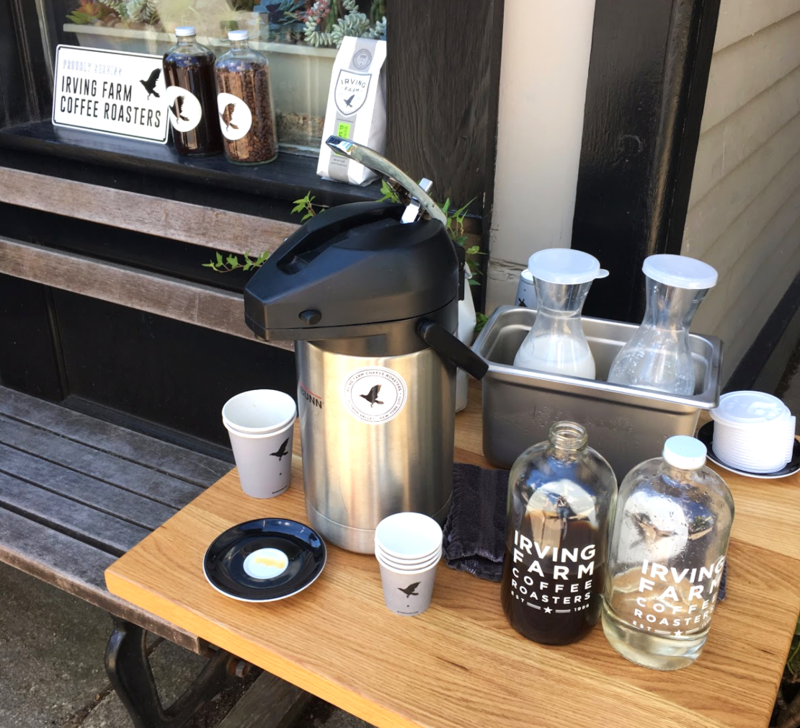 Next on the agenda, we walked up the block to sample another caffeinated beverage at Irving Farm Coffee Roasters where we met with coffee expert, Jake Griffin. David Elwell and Steve Leven’s coffee shop, Irving Farm, distributes socially responsible coffee. 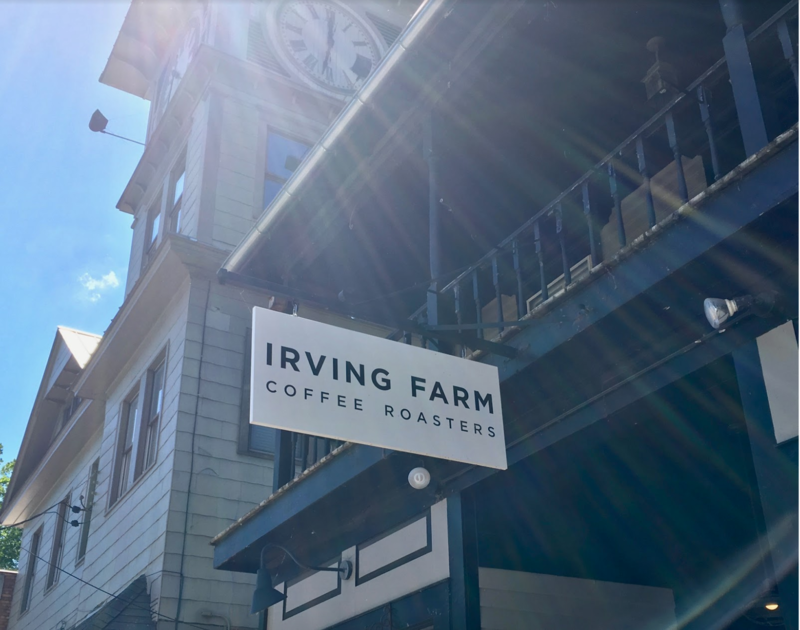 Irving Farm Coffee Roasters was Founded in 1996 by David Elwell and Steve Leven, starting with their Gramercy Park cafe. After learning all they could about the art of coffee, Elwell and Leven soon started roasting their own coffee in Millerton and opened a cafe in the village as well. Irving Farm proudly carries socially responsible coffee, locally roasted and grown without pesticides. 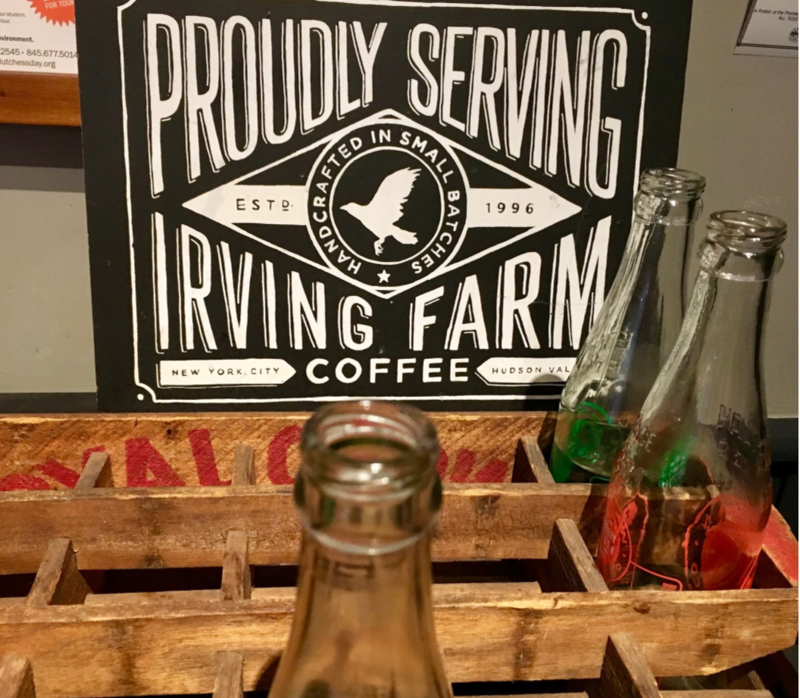 Sampling Irving Farm’s locally-roasted cold brew. 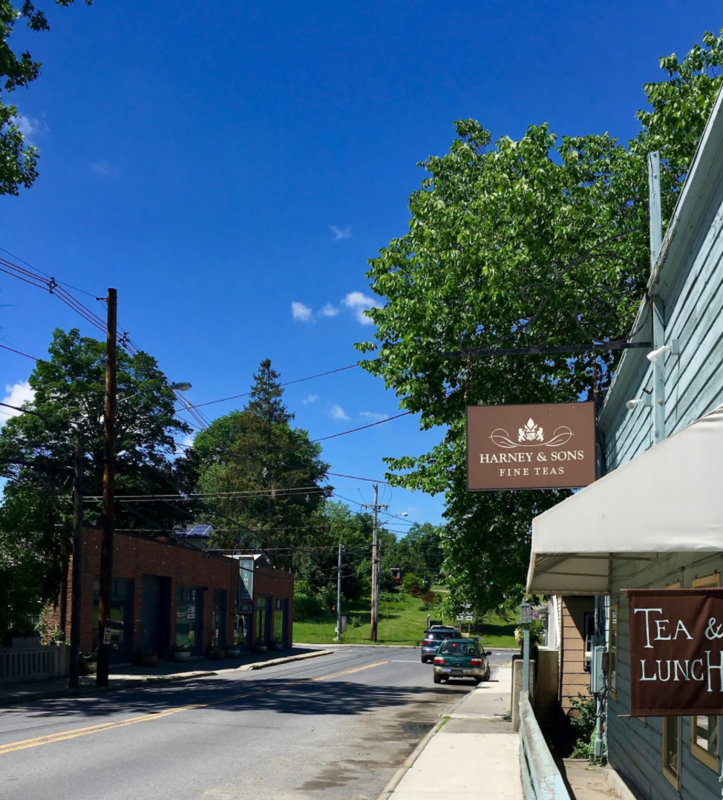 Their cafe in Millerton is a community hub serving delicious lunches and tempting baked goods, they also have eight locations in NYC and their coffee is carried at most Whole Foods Market locations in Manhattan. David gave us a sample of their brand new cold-brew, which will be hitting the market soon. Fully caffeinated, we hopped back on the bus and headed out to McEnroe Organic Farm and Market. McEnroe’s more than one-thousand acre farm is home to chickens, cattle, pigs, and during Thanksgiving, turkeys. 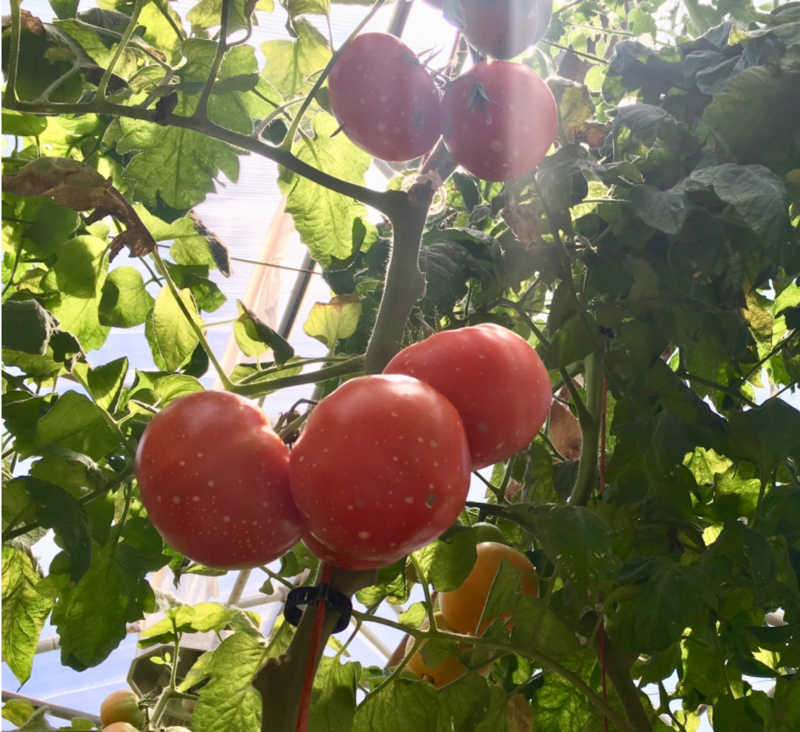 They cultivate a wide variety of fruits and vegetables including grains to feed their livestock: strawberries, blackberries, and tomatoes. We were led by the head of Educational Programs, Anna, and educational apprentice, Ali, who showed us around the farm. 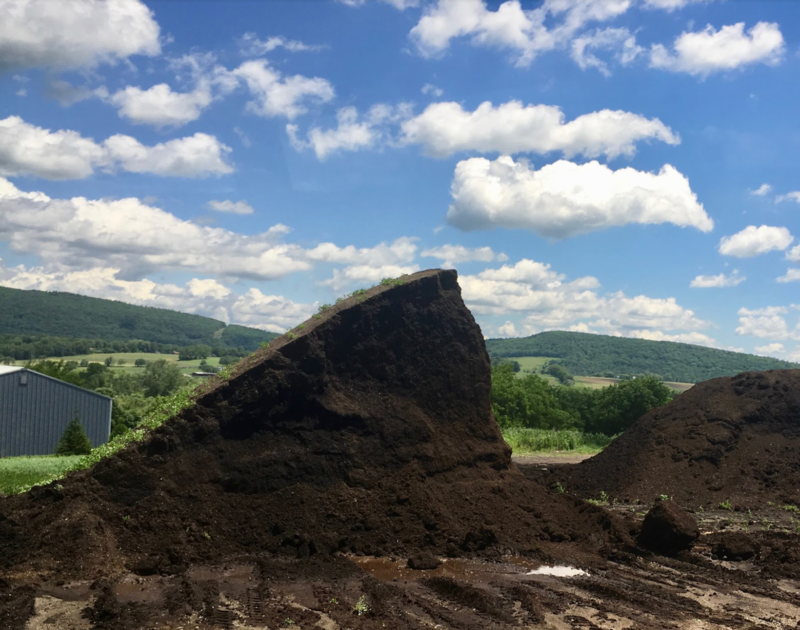 We visited their glorious compost pile, which they use on site and sell to other organic farmers. You can find McEnroe’s meat and produce at several local restaurants including Aurelia and The Farmer’s Wife. 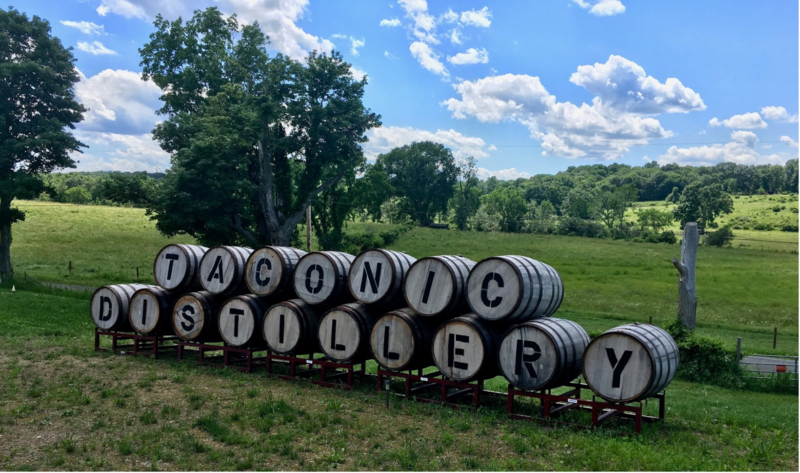 After eating a marvelous lunch in their public garden, prepared by McEnroe Market and featuring ingredients from the farm, we headed to Taconic Distillery. 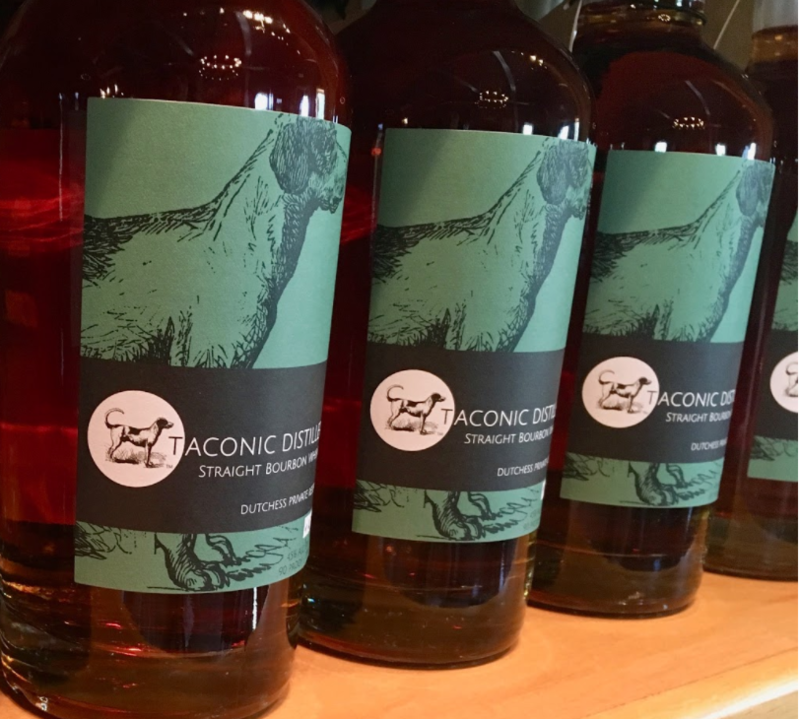 Taconic Distillery uses New York State grown grains. 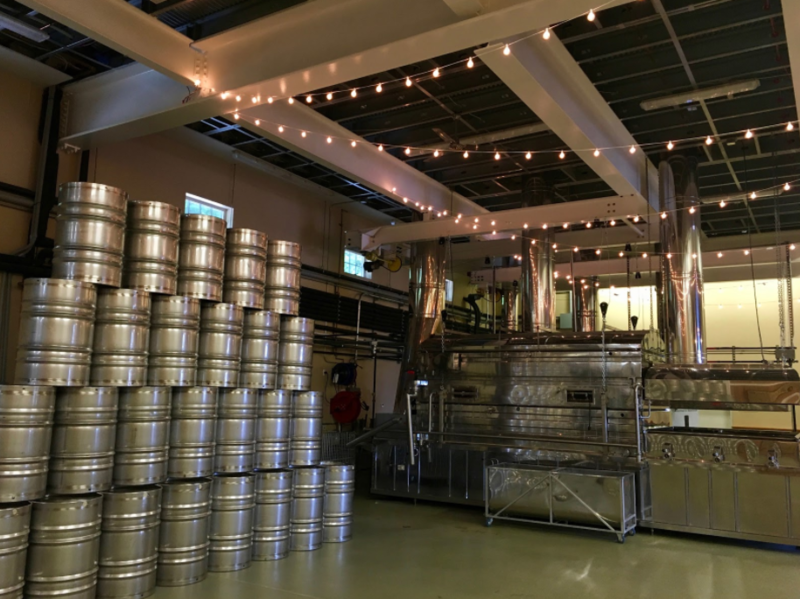 Only three and a half years old, Taconic Distillery has an impressive operation making “brown liquors”, distilled from New York State grown grains and using the finest techniques. 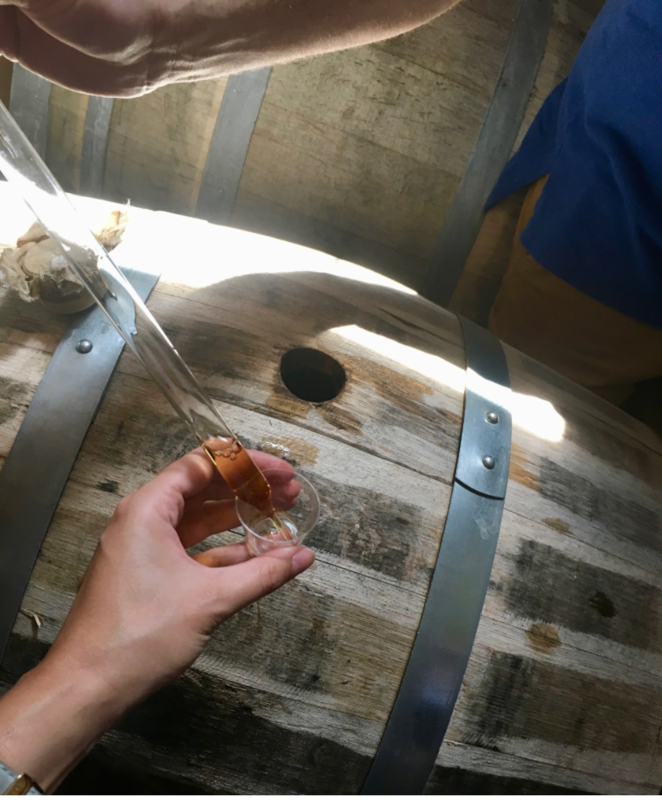 The informative and enthusiastic Matt Frohman and Carol Ann Coughlin gave us samples of their bourbon, whiskey, and rye in several stages of aging including straight out of the barrel. Sampling straight from the barrel. After a few stiff drinks, a raffle, and an overall festive visit, we were off to the final stop of our tour: Crown Maple Syrup at Madava Farm. 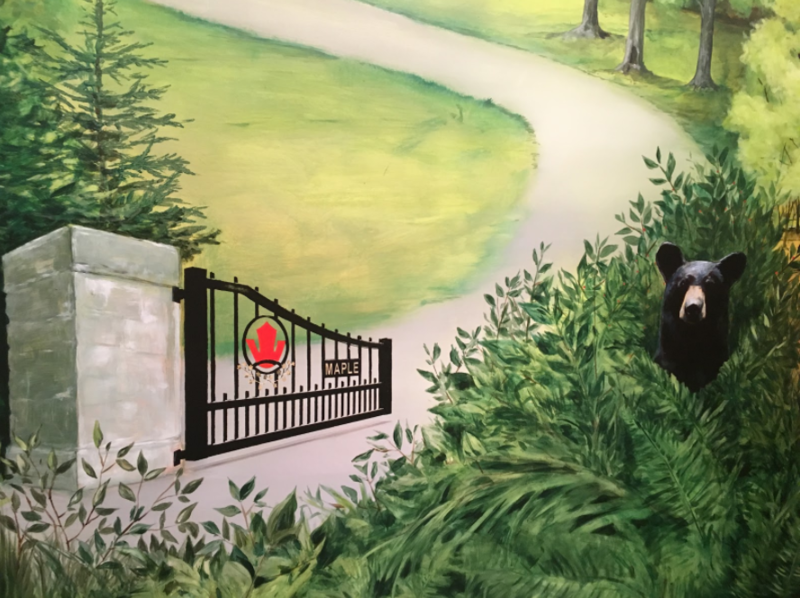 Crown Maple Syrup estate; mural by Sean Mellyn. 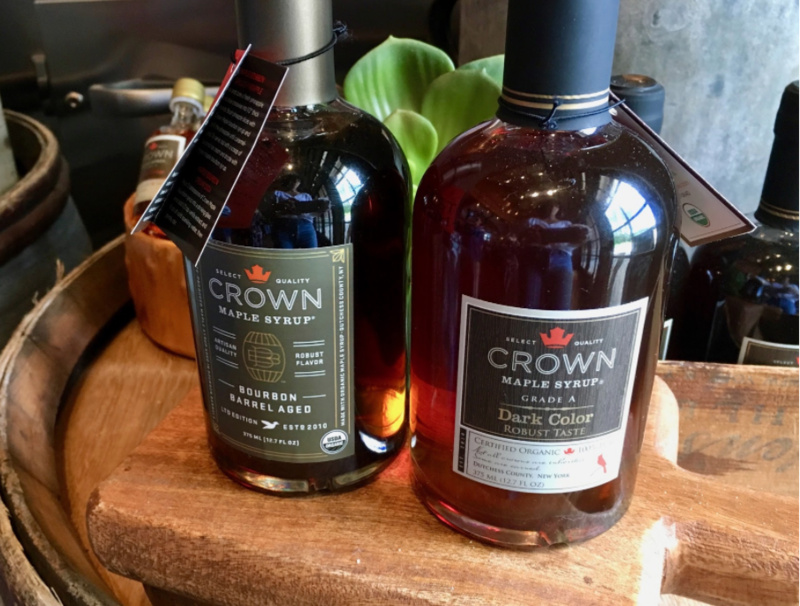 Located on an impressive estate and founded in 2010, Crown Maple Syrup is the third largest maple syrup manufacturer in the world and the largest in New York State. Harvesting sap from numerous maple trees on the property and processed on site, Crown Maple proudly boasts that their product is “bark to barrel in one day”. Crown Maple facilities, bourbon barrel-aged syrup, and the many shades of maple syrup. 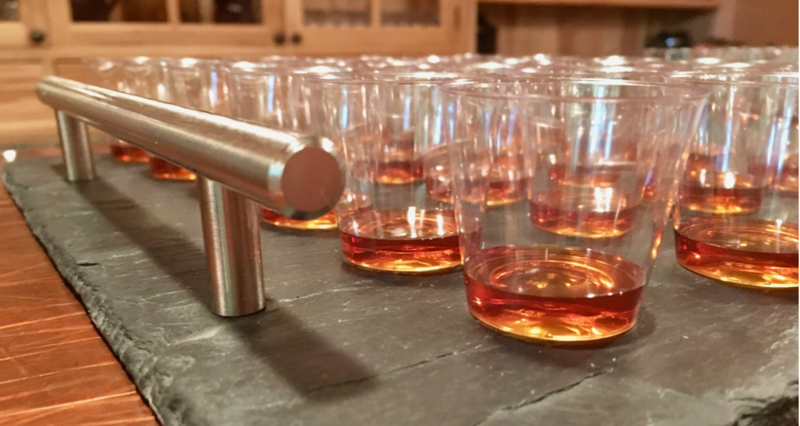 Kerri Travis lead us through samples of three shades of syrup, harvested at different times of year, as well as their maple sugar and Bourbon Maple Syrup, and showed us around their manufacturing facilities. Crown Maple is open to the public on weekends and also serves lunch and treats in their cafe. Wrapping up our day on a sugar high, our group sped off to the Wassaic train station and were back in the city by 6:40. To learn more about EscapeMaker trips, (prices start at $33.50 and include round-trip train fare), you can tune into HRN Happy Hour on August 3rd!